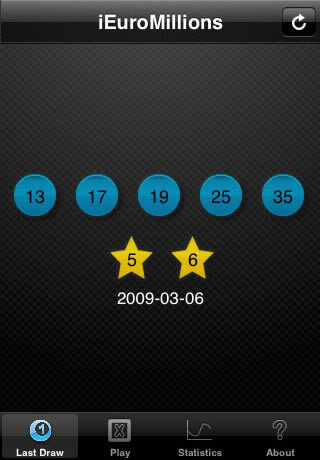 iEuroMillions lets you check the latest numbers of the popular pan-european Euro Millions (Euro Millones | Euro Milhões) lottery. 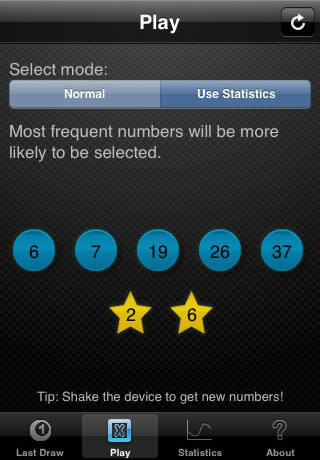 The numbers are fetched from the internet and then displayed to the user without futher delay. iEuroMillions also provides several tools for bettors including Statistics and a Random Number/Bet Generator with both a normal mode (completely random) and a statistics mode (uses the statistics to improve the odds). 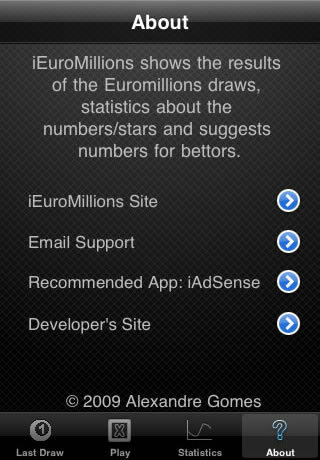 You can also check the screenshots section to get a feeling of what iEuroMillions looks like. How do I get iEuroMillions for the iPhone or iPod? If you don't have iTunes available, simply search for "iEuroMillions" on the AppStore at your device. How do I get iEuroMillions for Android? Alternatively you can also search for iEuroMillions at the Android Market application. iEuroMillions is developed by Alexandre Gomes, a software developer and consultant with several years of programming experience. Other creations for the iPhone and iPod include iAdSense and more to come soon.